Guido Schneider and Jens Bond team up for a deep excursion on Luciano’s Cadenza Lab label, assisted on the remix from by Monty Luke (Planet E). 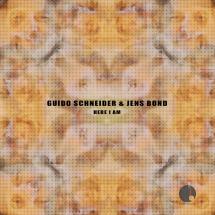 Bringing with them an enviable recording and remixing CV that includes releases for Poker Flat, Immigrant, Hypercolour, Fear Of Flying, Cocoon and Moon Harbour, Schneider & Bond head this release with the deliciously deep “Here I Am’. A moody and spacey production is wrapped in melodious pads and a great vocal hook, floating brass licks and dubbed out percussion seal the deal on this super track. Monty Luke (Black Catalogue/Planet E) brings some Detroit heat to the proceedings, ramping up the percussion on his ‘Afromix’ and delivering a raw, analogue version of ‘Here I Am’. Wrapping up the EP, ‘Flags Of Peace’ continues the quality with a solid groove, light organ stabs, Balearic guitar licks and another thoughtful vocal monologue, Schneider and Bond bringing an air of maturity and sophistication to their production sound that completes this well rounded EP for Cadenza Lab.